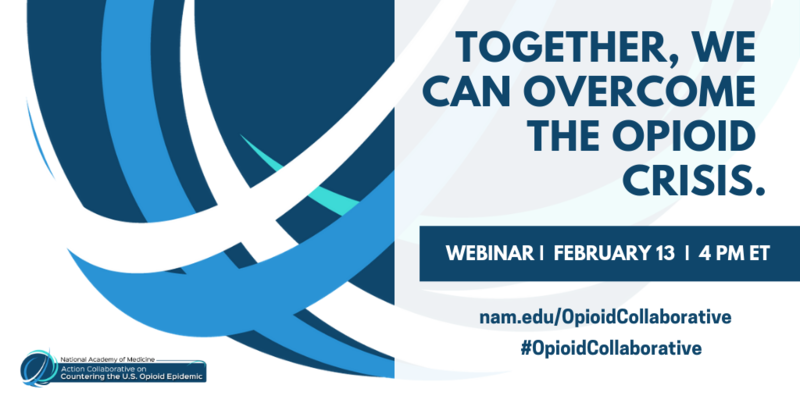 The National Academy of Medicine held a webinar on February 13, 2019 featuring an overview of the Action Collaborative on Countering the U.S. Opioid Epidemic and the work it will undertake over the next two years to share knowledge, align initiatives, and advance multisector solutions to improve outcomes for those impacted by the opioid epidemic. Every day, an estimated 130 Americans die from an opioid overdose – a grim statistic that has devastated families and communities around the nation. Due to the complex and urgent nature of the epidemic, reversing the opioid crisis will require a multi-sectoral and multi-pronged response; no organization, government agency, or sector can solve this crisis on its own. Within the past year alone, numerous initiatives, reports, guidelines, and recommendations have been developed to address the epidemic across the public and private sectors. With so much activity underway, strong mechanisms to support better coordination, information-sharing, and evidence-based practice are needed. To improve coordination and accelerate the pace of change, the National Academy of Medicine has partnered with the Aspen Institute and more than 50 other organizations to form an Action Collaborative on Countering the U.S. Opioid Epidemic.